It can be heart breaking. I know. You’ve slaved away to make a beautiful, healthy meal. Poured your heart and soul into it. And it gets left on the plate. Usually with a disdainful look. Mothers of small children are probably the most familiar with this unpleasant scenario. As I (unfortunately) know only too well these days with an almost-3-year old in the house. Sometimes I wish I was one of those parents talking about how their child loves olives and broccoli and kale and chilli and anchovies. But then Fergal wouldn’t be the Fergal I know and love. And I wouldn’t have this amazing opportunity to (hopefully) help him learn to love a bigger variety of food. Plus fussy eaters can come in all shapes and sizes so if you have a larger one on your hands these tips are for you too! 1. Try to see it from their perspective. Our tastebuds and eating history are all different. So it’s super important to remember that what you experience when you pop that delicious broccoli in your mouth isn’t the same for others. You can’t know what it’s like for them so keep the judgement out of the equation. One of my playgroup friends told me about a book that really helped her family. And mine. Basically the deal is that as the cook it’s your job to put appropriate food on the table. It’s then up to your eater (and his / her tummy) to decide how much of this to actually eat. I’ve found this mindset shift super helpful. Because it’s no longer my responsibility to ‘get’ Fergal to eat his dinner. So I don’t stress if he leaves the table with an empty stomach. It’s his call. Of course, you know that toddlers are super smart and as soon as you stop trying to ‘get them’ to do something they’re waay more likely to do it themselves. I have a dream that we sit down to eat the same thing as a family every night. But reality is Fergal has his dinner at 6 and my Irishman and I eat after the boys are in bed. At this point Fergal is a tiny carb-lover whereas we’re the opposite so a one-size-suits-everyone meal isn’t happening. Rather than cook two meals every night I’ve found cooking in bulk to be key! If I cook a special meal for Fergal like his favourite Egg Fried Rice I make 2 or more servings for lunch or another dinner. Most nights I try and just add carbs to whatever we are having. Again cooking in bulk really helps so I have a supply of cooked rice, quinoa, pasta, spuds or sweet potato to just heat and serve during the dinner scramble. Just keep offering a variety of food. The thing to remember is it can take eight or so exposures before we enjoy some ingredients so persistence is required! For more on this I recommend reading Jeffrey Steingarten’s book ‘The Man Who Ate Everything’ where he tells the story of his quest to overcome all his food dislikes. Cauliflower is one of my favourite veg because it’s so versatile not to mention delicious! I also love it for fussy eaters because it’s super nutritious without any off putting green colour. Too good! 1. Place cauli in a pot with about an inch (2.5cm) water. Bring to the boil and then simmer with the lid on for 10 minutes or until cauli is no longer crunchy. 2. Drain well and return cauliflower to the hot pan. 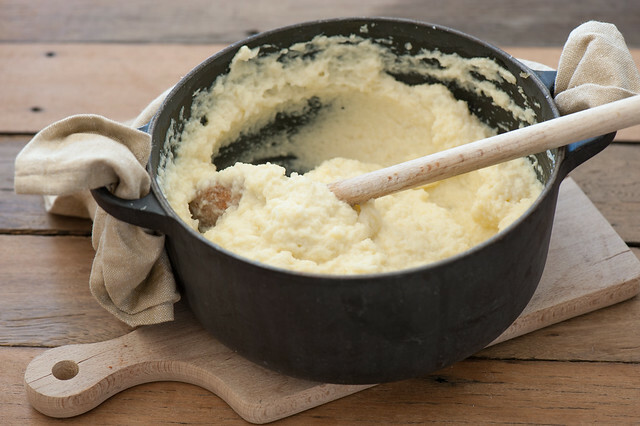 Add cheese and cream or butter and whizz using a stick blender or potato masher until you’re happy with the texture. 3. Taste and season with salt as needed. dairy-free / vegan – use olive oil or coconut oil. Skip the cheese or add a few handfuls cashews or pinenuts to the pot for the last few minutes or cooking. A few teaspoons of nutritional yeast can help boost the cheesy flavours. 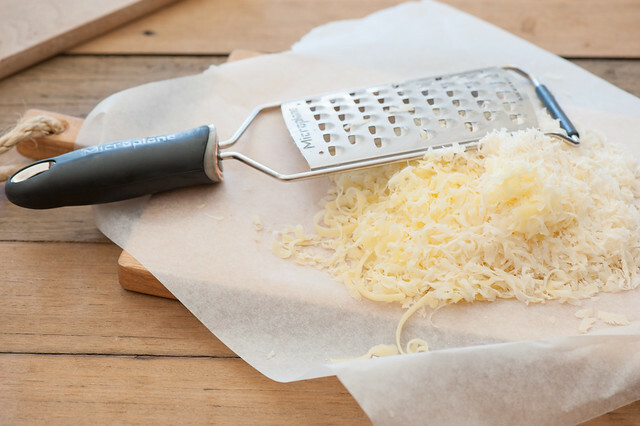 different cheese – most hard cheese will work like cheddar, parmesan, Gruyere or Emmental. different veg – try broccoli, celeriac (celery root), parsnip, sweet potato or of course good old spuds! Or a mix of any of the above. ps. Do you have any fussy eaters in your house? I’d love to hear about your experience in the comments below. Especially any tips that have worked for you! I have an adult friend (45 years old) that is a picky eater. He will only eat pizza, wings, steak, lasagna, hamburgers, and macaroni and cheese. His idea of fruit is canned fruit loaded with sugary syrup. He eats no vegetables whatsoever. That makes no sense to me since I grew up in a home with a substantial garden and every summer we had more fresh vegetables than I could relate here. I blame this all on the way he was brought up by his mother. She never disciplined him, I believe he’s slightly retarded and his mother had sympathy for him. But her actions ruined a person’s life. As an adult picky eater (I have avoidant food intake disorder focusing mainly on textures), I find it very helpful to have figured out what it is about some foods I dislike. For example: I can’t deal with beans, lentils, peas, etc., because the texture makes me gag and choke. So knowing *why* means I can work with that restriction to sneak legumes in in other ways — a broad bean hummus, or lentils cooked with fine-ground meat in tomato sauce so that they mingle with each other, and my texture problems aren’t set off. It also means I know what good substitutes are likely to be. I don’t try to make myself eat foods I know I won’t like, and I know what foods I _will_ eat. About once a year, I try again. I then fail, but I keep trying! That’s my major recommendation for picky eaters, either as cooks or being cooked for: why? What is it about the food that bothers that person?? Is it the smell of it cooking, like with friends of mine who don’t do brassicas? Is it the taste, like fish? Is it the texture, like raw tomatoes or beans? Knowing why means it can be potentially worked around, and helps the cook feel less like it’s a problem they need to solve. It’s not their cooking — it’s the food itself on that person’s senses. Thank you for this post! As a mother of five I can attest to those days/meals where someone is sticking their nose up at something I’ve made! I think your advice is right on the mark in terms of offering something multiple times. I made a recipe one month that my youngest twins hated–and then I made it again and it was their FAVORITE! I also love your advice of not stressing if the child isn’t eating. . .we try to encourage the “one bite rule” but I find not stressing about it works best. Omg Michelle.. 5! You are amazing! I am an adult super taster although I have never been tested before by a doctor, just me. I am also a super smeller. While this cauliflower that looks like mashed potatoes looks yummy, I can’t eat cauliflower. This would be well disguised but I can’t stand the smell of it cooking! I do have some texture issues but it’s mostly taste and smell. At first I thought it was an allergy until someone told me their friend had this problem and it wasn’t an allergy, they were a super taster. It hits my tongue and I have to throw up. I’ve learned to live with it. Same with the smell of things. I did what my dentist said and brushed my tongue. Breakfast, and lunch were in the sink and that’s the other way I know. I may not eat cauliflower, and I don’t like broccoli but if you chop it up small and disguise it something (the smell is okay for me) I’ll eat it. I love this package of cheesy broccoli soup that is loaded with tiny chopped up broccoli. I don’t like plain spinach but if it’s in my mom’s homemade chicken soup or I make creamed spinach, it’s yummy! I can’t eat any sweets at all, no cookies, ice cream or muffins unless they aren’t sweet. I love V-8 Vegetable juice and mixed veggies as long as they don’t have lima beans in them. I only like small beans like navy beans. That is a texture thing especially with cannelleni beans and because the small ones are not so much the magical fruit like the bigger ones. I love oranges and orange pineapple juice. For some reason I can eat natural apple sauce but not an apple. I don’t understand it and I am the only one in my family with this problem. I’ve heard that 25% of the population is a super taster. I’m not a fan of hummus or chick peas but making them in the oven with grated cheese so they are crunchy and cheesy and like a snack are great! Kale no I can’t eat that. I have a garden and I plant a lot of veggies that I love and that my family loves too. I wish I was a better eater but my sister claims she is a better eater then I am but she has a weight problem and I don’t. I forgot to wish you congrats on the new baby! Where are the pictures of the new baby like the ones of Fergal? Ah, toddlers are tough hey?! My two biggies are fairly good at eating but dinner is definitely the toughest meal. I make sure that there’s always something they’ll like on the table. It means I usually serve up some sort of carb because toddlers = made of carbs. ;) Ha ha. Some nights they seem to eat very little, but as you saw yesterday they’re not fading away! I find that they eat less as they day goes on. Breakfast is big around these parts and I (well Nick really seeing as he does breakfast) has high fibre and protein. Some days the girls will eat porridge AND egg and toast. I make sure they have a good protein for lunch too seeing as they’ll generally eat none of the dinner protein I serve up. I know this won’t work for you guys seeing as you eat separately, but I also find the girls eat a lot more if we’re all sitting together. These days we tend to have three meals at the same time otherwise they both stuff around and run off to play before they actually eat anything. I sometimes think it’s not so much fussiness as a general inability to sit still and concentrate on the act of eating. I’ve been trying to follow this rule, but some nights I can’t help but try to make her eat one tiny bite of each veggie/meat that she’s eaten before and liked or no story. I’ve found if she’s left her dinner, she sometimes lets me feed it to her while she’s in the tub. She was a great eater until we did an elimination diet to find out which foods were causing her horrible reflux. Now even safe foods get rejected. Dinner here is plain sticky rice, pearl couscous or fresh egg pasta. But there’s always 2-3 veggies or meat on the plate. Tough one Shelley.. I’d be a little wary of feeding in the bath though… But that’s just me.. I’m a strong believer in only eating at the table or kitchen bench. So true. So frustrating going through a full day of cooking and getting nothing but yucks at the table. Thanks for the tips, I will have to try these out. Woah cool video! What program did you use? A rule that helped me was to require the child to eat as many as his years. For instance, he doesn’t like peas and is two years old. He must eat two peas. That helped us both. He knew there was a limit. He didn’t have to eat a whole pile. Interesting comments here! It helps me to understand people. Having a childhood of being required to eat some of everything on the table and being served a wide variety of foods has helped me to enjoy almost any food. But maybe that wouldn’t have helped another person. I enjoy your food posts! Feeding 5 sons and hubby daily on a low grain, sugar free diet is challenging. Thankfully they aren’t picky for the most part. We all have high metabolisms and are tall and thin. That means lots of food! I wonder if it would make any difference if you ate with Fergal. It sounds like you feed him first so he must be eating alone.. Maybe if you ate with him for a while it would set a good example that food is yummy, not just this scary stuff on his plate that no one else is eating. A friend told me this once, which helps me — that it’s a balanced diet over a period of a week or two. So I don’t worry if they eat lots of one food one day but not the another because I know we give them healthy things and it’ll work out well enough over a short time period. We have a rule to taste everything and that seems to work for our boys. With our 8 year old, he’s learned to be willing to try things and I’m often surprised that he likes things I would not expect him to like. I also keep re-offering things, especially with our second boy. With our older one, I was too quick to give up on offering him things if he rejected them early. I’m also making a point to give our second son more of the “weird” things I eat now (green smoothies, small tastes of salads, etc.). He seems to like it and I can’t help thinking it’ll help him be more open to trying things later on. I *hate* putting kids to bed if I am hungry (way too stressful) so we just eat early all together. And we pretty much go to bed right after they do anyway! I feel like it’s nice to eat together. I’m going to try your rice in the freezer strategy. I tried the Cheesey Cauli Mash last month. I steamed the cauli then mashed with butter and cheese. It was bland so I added more salt and pepper. It was still bland so I added more cheese and butter. Still bland. More salt and pepper. I didn’t eat it all and the next day I warmed it up and added the rest of the cheese and more salt, pepper and butter. I have another cauliflower and will try again with a stronger flavor of cheese and more salt and pepper and butter. Maybe I’ll add some turmeric and/or paprika as well. I like cauliflower, I eat it raw as well as cooked. My older grandson was so picky that we used to tease him: “You don’t like *anything*!” although that wasn’t totally true. But he is six now, and has outgrown the worst of it – he even insisted on ordering fresh sardines in a restaurant, although his mother said he couldn’t possibly know that he liked them as she didn’t, and wouldn’t have served them! He ate the lot! Younger brother is a bit of a foodie, and loves to cook, which helps. I love sardines Annabel – your grandson has excellent taste!